We love taquitos in our house, especially the cheese ones. I will admit that I have been known to buy those boxes of taquitos in the freezer section of the grocery store. I know they are expensive and not very healthy, but they make a quick and easy, kid friendly meal. Over the years I have tried to make them at home, but I have had mixed results and have had trouble coming up with a recipe that my family liked. A few months ago though I came across a recipe on the Martha Stewart site for flautas. The recipe contained a technique that I had not tried before. It had you baking the tortillas and cheese first, than adding the rest of the toppings. You then rolled them and put them back in the oven to crisp up. I instantly knew that this technique would work well for homemade taquitos. I do need to research the difference between taquitos and fluatas, because they sound very familiar, if not the same thing. What I am calling a taquito may not be an actual taquito, but we will leave that for another post. For now let’s call these taquitos. I gave this technique a try with just cheese and it worked perfectly. They rolled up great with out splitting and were much healthier than the fried taquitos that I have tried in the past. 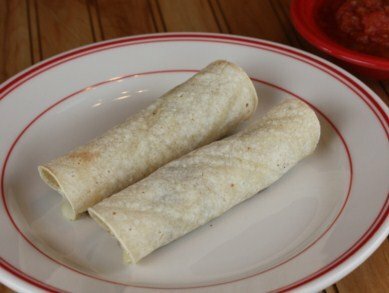 Today’s recipe is just a basic cheese taquito, but I have been playing around with this recipe a lot lately and have several other versions that I will share soon. If you are looking for a quick and easy, but also inexpensive lunch or dinner to try, these taquitos are perfect. Lay tortillas on two baking sheets in a single layer. Depending on your size of baking sheet, you may need to use 3 sheets. 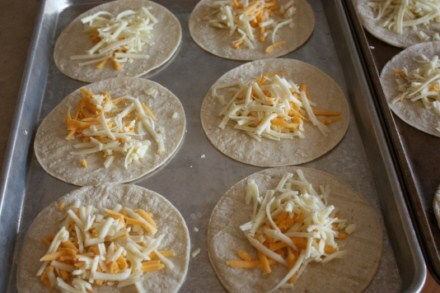 Bake for 2-3 minutes or until cheese is starting to melt and tortillas are softened. Remove from oven and carefully roll each tortilla up. These are hot so be careful. Return to oven and bake for 6-8 minutes or until crisp. Do you have to use corn tortillas or would they work with flour or wheat? @Brandi, I think they would probably work with flour tortillas, but they may not crisp up the same. I would say try it and see though. I have only used the corn since some in my family eat gluten free. I would love to hear how it works if you try it. My understanding is that a flauta is a flour tortilla. Taquitos, invented in San Diego, by the way, are corn tortillas. I make a baked version where you soften the tortilla in oil first and then fill and roll. Bake until crisp. Yum! @FishMama, I know fried is better. 🙂 But this way is quicker. 🙂 Martha might have it wrong then because her flautas use corn tortillas. Now I am going to have to research it. I see a blog post coming…..
We lived in Mexico for 6 years and down there where we lived (Sonora), flautas were made with mashed potatoes inside and taquitos are rolled tacos with meat in them. None of these had cheese in them:-) I do know that there are alot of variances in different regions of Mexico, so this may vary from region to region, too. @Erica Burgan, What Americans think of as Mexican food is probably far from what they actually eat in Mexico. I am thinking most of what we call Mexican food is actually Tex-Mex. I have heard that before on the tortillas and that corn tortillas are not what the majority of Mexico eats. I am guessing Americans eat a lot more cheese with there Mexican food than the actually eat in Mexico also. 🙂 The mashed potatoes in flautas is interesting. It would probably be really good. Thanks for the information! Last week I realized instead of baking our oven fried chimichangas I could grill them. They turned out out amazing and will definitely be a summer staple in our house. @Heather Solos, I saw your post on that and I need to try that. We love grilled quesadillas so I think we would love those. So what’s the difference between these and quesadillas? @Sharon, These crisp up a little different, but they are similar to a quesadillas. Well, whatever these are properly called, they sound delicious and I believe I will be making some for dinner. I wanted to get corn tortillas, but for some reason I could only find flour tortillas in Target. And since I was there on my lunch break at work, I didn’t have extra time to go searching for the corn tortillas. Oh well, I’m sure my husband and son will like them no matter what! @Kristine, I am so glad they worked for you! @Heather, I am so happy you enjoyed them. We like to add taco meat or beans to ours sometimes also to make them a little different. I am glad even your picky eater liked them. This recipe saved dinner tonight! Thank you so much! Will become a staple at our house. do you could make ahead and flash freeze? I have never tried it and I am not sure the texture would be the same freezing these. Taquitos are typically made with corn tortillas while flautas are made with flour tortillas. Thanks for all the great recipe ideas — keep them coming. My husband is from Honduras. They call taquitos tacos hondureños, or tacos dorados. They don’t ever use flour tortillas for taquitos, but they do for baleadas. Flautas (flutes in English) are the same thing, just the Mexican version. From my understanding they use both flour and corn tortillas. A true taquito isn’t just cheese, just cheese would be more like a Taco Bell cheesy roll up baked. I use chicken or pork when I make taquitos, and they’re deep fried. Top mine with mounds of thinly sliced cabbage, tomato, green olives, queso fresco or mozzarella, and taco sauce. My husband prefers plain tomato sauce from a can, mixed with an equal amount of water to make it a very thin sauce. Thank you for sharing what the real taquitos are like. I think Americans call a lot of things Mexican food that isn’t at all Mexican. We have probably totally changed it to what we are used to and what fast food places like Taco Bell serve. 🙂 So thank you for sharing what a more authentic taquito is like!